The brushless-powered RTR Trophy Buggy Flux from HPI is the go-to kit for all-out fun and excitement combined with mind-bending top speeds! The Trophy Buggy has been a hugely popular 1/8th buggy, and now that it’s fitted with the demonically fast Scream brushless motor and the 4S-capable Flux Rage speed controller, you can finally see what all the excitement is about with 1/8th electric buggies at a great price! Ready-built right out of the box and fitted with an all-new 2.4GHz radio system, the Trophy Buggy Flux is the perfect introduction to serious 1/8th off-road buggies! No need to worry about changing crystals, the radio prevents frequency conflicts automatically. If the car ever loses radio signal or battery power, an electronic failsafe will bring it to a safe and controlled stop. You get big-air fun and race-track performance in one easy RTR package! The Flux Rage is a monster of a speedo: able to handle twin 2S batteries for up to 4S (14.4 volt!) power, you will experience mind-bending top speeds and blindingly fast acceleration for huge stunts, massive jumps and burly maneuvers that will make your jaw drop! Also, if you ever want to change your speedo settings, you’ll be able to experiment easily with the #101280 2 in 1 Professional Program Card! You can change the amount of braking the speedo uses on the motor, reversing speed, motor timing and even the motor for accelerating smoothly in different traction conditions! The chassis of the Trophy Buggy Flux is based on the nitro version of the Trophy Buggy, so it’s ready for anything you can throw at it. The aluminum construction provides the perfect foundation with its combination of low weight and high strength, and the smart design and layout of the components make working on the car fast and easy! The Trophy Buggy Flux uses a suspension taken directly from top racing truggies – it was designed from the ground up to be tough, reliable and adjustable for any type of terrain, whether it’s a BMX jump trail or a top-level racing track! The suspension is fully adjustable and equipped with turnbuckles, multiple shock mount and camber link locations and more. • Proven race geometry with championship-inspired design. The zero kingpin ‘inverse angle block’ design is a definite winner, and out on the track it will give you the confidence you desire as you go head to head against the club pros! • Strong steel turnbuckles with chunky gripping points for easy adjustment of camber and front toe. HPI makes it as easy as possible to get into RC Off-Road action. 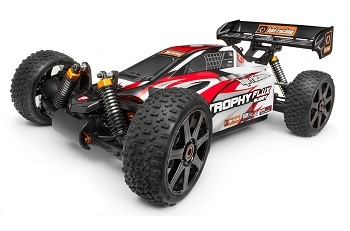 The Trophy Buggy Flux is completely pre-built and ready to go right out of the box! Everything is assembled and tuned for you by professionals – diffs, shocks, suspension and more are perfect before you even open the package. And with many top racing features already installed, you don’t have to do a thing to get going fast! The bodyshell is new on the Trophy Buggy Flux, with a super-cool multi-colour paint scheme designed by Jon Miller from RCS Graphicworx. I have this buggy and its great!!! A car ran it over completely!! And only the shock tower was bent very durable buggy! !